OHN BURNETT/Tribune-Herald Staff Sgt. 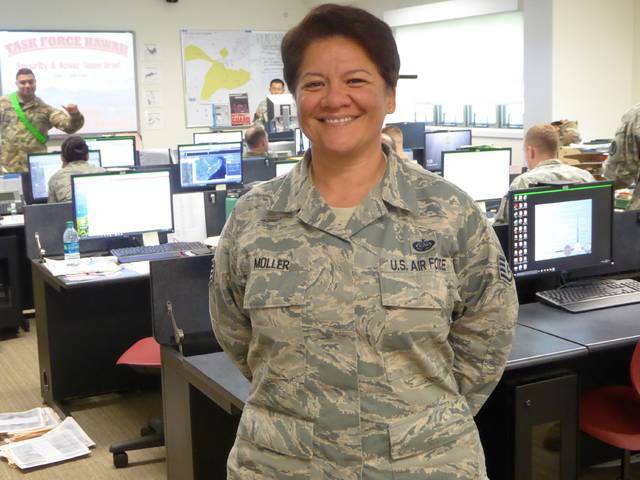 Haliaka Moller is on duty Sunday in the operations center at Keaukaha Military Reservation in Hilo. As management of the emergency resulting from the Kilauea volcano eruption that began May 3 transitions from response to recovery mode, the number of Hawaii Army and Air National Guard troops deployed to East Hawaii has declined dramatically. As of Friday, about 130 National Guard personnel were assigned to lava emergency duty, according to Guard spokesman Lt. Col. Chuck Anthony. That’s down from the 207 deployed here just a week earlier, which Anthony described as the largest number of Hawaii National Guard soldiers and airmen called up for domestic operations since the Asian-Pacific Economic Cooperation summit was hosted in Honolulu in 2011.